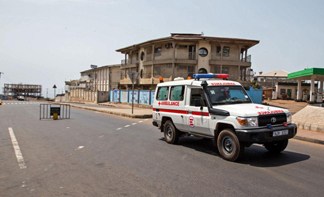 Lifestyle Health Report: Officer Involved Shootings Decreased by 17 Percent in L.A.
Sierra Leone found 10 new Ebola cases during a three-day countrywide shutdown, an official said Wednesday, declaring that the West African country is now at the "tail end" of the epidemic. Hundreds of sick people were identified on Friday, Saturday and Sunday as health teams went door-to-door in an operation that also aimed to remind people how to prevent Ebola. But only 10 of the sick eventually tested positive for the disease, said Alfred Palo Conteh, the head of the country's Ebola response. That figure indicates that there were not hordes of hidden Ebola cases as some had feared. By contrast, during a three-day shutdown in September, when the epidemic was raging, more than 260 new cases were found. "The fact that there weren't that many cases after this effort, I think that's a great sign," said Dr. Dan Jernigan of the U.S. Centers for Disease Control and Prevention. Conteh said Sierra Leone had "conquered the Ebola disease and we are now at the tail end." But others have cautioned that there is still much to be done to get rid of the disease in the country. In fact, the three-day shutdown was meant to remind people that the outbreak is not over and to fight complacency. Conteh himself said the shutdown revealed that some traditional leaders are still conducting unsafe burials. The bodies of people who have died from Ebola are particularly contagious, so they must be handled with extreme care; traditional burials, where people touch the dead, have been a major source of new infections. The current Ebola outbreak in West Africa has killed around 10,500 people, the vast majority in Sierra Leone, Liberia and Guinea. Associated Press writer Sarah DiLorenzo contributed to this report from Dakar, Senegal.